Home > Alien Contact > Have You Been Abducted By Aliens? Have you been abducted by aliens? The question sounds absurd. Surely it could only be meant as a joke. Yet, there are those who believe that a vast number of us - millions of people across the world - have been abducted by aliens without knowing it. What’s more, there is some serious research data to back up their claim. The memory loss is crucial. Typically, memories are only recovered during hypnosis, although sometimes fragmentary recollections occur during nightmares – which many abductees experience with unusual frequency. For a time, there were some in the UFO research community who argued that some kind of alien experimentation programme was taking place on a large scale – that perhaps thousands or even millions of people were involved. Even in a community which is not averse to conspiracy theories, this sounded like a conspiracy theory too far. Then came Robert Bigelow. Robert Bigelow is an American billionaire. If you want to get a picture of just how rich he is, think of this – he owns his own spaceship: Genesis I. It’s the only private spaceship in space. Bigelow had a long-standing interest in UFOs and, after making his money in property investment, he began to throw some of it into some unusual fields of research. One project Bigelow financed was an attempt to find out just how many people may have been the victims of alien abduction. Questions were inserted into market research surveys designed to elicit this information. People were not asked directly whether they had been abducted by aliens. Instead, the questions were subtle and asked about more limited things which were consistent with the alien abduction experience. Have you ever woken up paralyzed with a sense of a strange person or presence in the room? Have you ever found puzzling scars on your body and not remembered how you got them? Have you ever experienced a period of an hour or more in which you couldn’t remember how or where you had been? Have you ever felt as though you were actually flying through the air? Have you ever seen unusual lights or balls of light in a room? When respondents answered positively to 4 of these 5 questions, they were deemed to have been the likely victims of alien abduction. In the 1991 survey, 1.7% of the population sampled answered positively to four of these questions. It should be pointed out that the questions themselves were developed in close consultation with Budd Hopkins, one of the leading researchers of the alien abduction phenomenon and that the actual polling was conducted by the Roper Organisation, a highly respected market research company. If the methodology of the survey was sound and the questions chosen were accurately reflective of an underlying experience, it would appear that almost 2% of the U.S. population – around 5 million people – had been the victims of alien abduction. Critics retort that the questions were too oblique to be indicative of anything. Supporters insist that direct questions would have been less useful because of the “missing memory” problem and because some respondents might have been too embarrassed to say directly that they had been abducted by aliens. No similar surveys have been undertaken for the UK, but if the numbers were comparable, it would mean that around 1 million Britons had been kidnapped by aliens. Could this possibly be true? I rememeber when I was a baby maybe I was chosen at a early age. First memories was flashing green light on my stairs. I once work up with small redcircular dots with one dot in the middle on my right bicep. Behind my ear I had a small hole which need medical treatment not sure we're it came from. Scar on the tip of my nosethere are other things that happen but can't reveal just yet. many people wonder why them . All it takes to create a new world, army , food supplyis sperm and eggs . Are we biological machines made to be eaten or slaves and we just don't kown it. We are being control , try and think without influence , !!!hard!!!. The earth is a gift for all but enjoyed by few . My first experience was in 1984. I was 17 and had found out I was pregnant. I even had a scan at the local hospital which had shown a 5 week embryo. One day I was walking to pick up my youngest brother from nursery and it felt like I blinked and then it was half an hour later and I was much further along. The scariest thing though was the baby had disappeared and all my hospital records had vanished. Hi, I experienced unusual occurances when I was younger but also on into adulthood. Mainly experiences were associated with sleep and either waking to strange goings on or memories of dreams that were abnormaly real, on a couple of occassions dreams proved prophetic. Invariably my memories of early occurances became less vivid over time but much more recently I experienced something very difficult to comprehend and find it troubling. When I was younger, an intrinsic component of each experience was the absolute lack of desire to think on the subject, no matter how strange, but rather just to shake it off and pay it no heed. Being older I now find the memories of recent occurances are not so easily subconciously repressed. I have been intentionally vague in writing this and post it mainly so that anyone in a similar position can take heart from the fact that at least theyre not alone. I guess I also post it because the need to understand my experiences is greater now, so maybe its a plea for help also, but then perhaps somethings are best forgotten. My father's half of the family were all abducted. I've never talked to anyone else about it but my father but he said they were small and weren't rude or mean they just talked to him. But I've been told parents who have been abducted have a chain reaction meaning their kids will be abducted. So long story short. I'm extremely paranoid wanting an anwser to one question. Does this mean my sister and I will / have a chance to be abducted? While abduction is somewhat of an ET instructed adventure repeated follow up contact can last for months and probably doesn't include further abduction at all. Telepathic contact features survivor skills, lessons pertaining to their dimensional perspective, our collective histories with one another, both dreamy and 3D, concrete reality scenarios.One tip: Never trust a talking voice inside your head.Telepathy doesn't require language or words and, so far, it rings true.Humans overcoming ET scripted deception is a popular pastime with many up there.They also gamble on the outcomes frequently if not habitually. Since my abduction on the A70 I ended up uncovering a nightmare scenario that stretches as far back as the 1920s, my first thoughts at the time was that it was military due to my association with NASA in 1995. the investigation I carried out night and day uncovered quite a few military secrets at the time but not the answer to my abduction, only after years of searching did I start to get answers that led to face to face contact with different species some alien. Yes I know it all sounds like the ravings of a madman but guys they are real and some do have military involvement and best left alone. I was not abducted but I had and OBE not from serious illness. 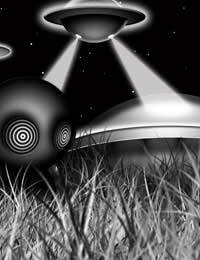 I was on a different plain and surrounded by aliens who telepathically communicated. I remember asking why me! and not a scientist or powerful person? I was told many things that have yet to pass. That there are people who are key to what will be.... The sky was a golden colour and the ground hilly, of an emerald green, their houses were like igloos in shape of a greyish colour with slits as they were tall and thin brownish and had three long fingers. I was being studied by the young ones and to my left one held out his hand I gave him mine, it was cold to touch.I did not feel fear nor danger it was a great experience, sadly I felt my being returning into the room and back into my body, I had elevated up to the top left corner of the room. I then proceeded to talk about scriptures and time, I was predicting the future and in the room was a friend and my brother. Being a sceptic I dismissed the whole thing, the friend was spiritual and took me to a spiritualist to get some clues or guidance. We could not get a one to one so we went into a hall of about 30 people, to the end the clairvoyant came to me and said a few truths of a past then said these words 'you came here for confirmation of what happened last night, it has been confirmed'this sent chills. I never spoke about the incident which happened in 1982 November. My dreams of UFO as a child were vivid and fantastic all before Spielberg films, one thing, many drawings of aliens are not like the ones I met.Since then I have been sensitive to reading people and feeling the world weird but true and a burden. I see and feel things. Whenever I dream its either I feel like im falling at some point or someones being disected. The first dream I remember was when I was 4 or so i was at a huge house and children were lined up the stairs so for some reason i walked to the front of the line just to see what the line was for and an old lady was taking their eyeballs out. The children werent scared at all but I was so I ran down the stairs and every child was focused on me as I ran by. I ran outside to the pool where the adults were and then I woke up. The other dream I had was of driving really fast on the highway with my mom and all of a sudden the road was gone I fell toward a river and felt the sensation of falling all the way down and then i woke up. The last dreamI had there were beings that took me from my room to the front door of my house where theres a bench. they set up a contraption that was basically an upside down needle. They carried me over the needle and lowered the bottom my spine to the needle until my weight pushed down on itcausing it to inject me with whatever was in it. And the last weird feeling I had was falling right as i woke up. I often feel like im falling when i go to sleep too. I don't know about aliens but I feel like something is here and its not anything we can control. Ever since i was eight i have experienced wierd paralysed moments. when i was eight for the first time i woke up out of sleep and in the doorway to my room stood a man that wasnt really a man his eyes they was the only thing i could remember to this day they seemed to glow. since then i would be awake and fall asleep my eyes would move rapidly i would try to move and cant and have the feeling that someone is there with me. infact this happened last week the feeling of floating and the voices of something talking to me thats all i can remember i cant remember anything else except fighting them with really no known reason to fight. It has happened a few times during my life that I will suddenly wake up with the sense somebody is in my room and that I am completly unable to move, this has happened even with people in the house during day times. What does this mean?